Our metal roofing systems are the most advanced, engineered and highest performing roofing systems in the Marianas region and are endorsed by Navy and Air Force. Engineered and certified for wind speeds in excess of 195 MPH, we have become the basis of design for both Navy and Air Force specifications for new and retrofit metal roofing. 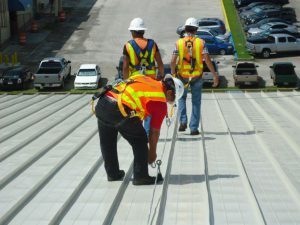 We have over 300,000 square feet of roofing in place at Navy Base Guam alone. Our roof systems can be warranted for 20 years against leakage, panel degradation and paint failure. For government work, we provide a 20 year No Dollar Limit (NDL) weathertightness, corrosion failure and paint warranty, which is the highest performance standard for metal roofing systems in the world. Our systems are installed by factory certified crews and can be designed as retrofit or new applications and we provide engineering and estimating support for both materials only and furnish and install projects. Our product offering ranges from light gauge exposed fastener steel panels to heavy gauge standing seam products in steel, aluminum and copper, and we proudly offer Cool Roof systems with some products. We offer standard silicon modified polyester, kynar, modified kynar and high build paint systems for specialized applications. Our field technicians are factory certified to perform roof inspections and installation of our factory backed warrantied roof systems. Pre Engineered metal buildings are the dominant choice for new, affordable buildings. 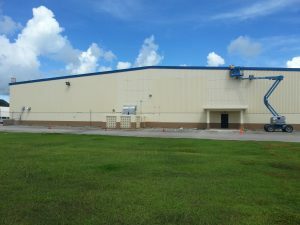 Our systems are fully engineered and certified for Guam weather and we have designed and built the nation’s only FEMA Category IV Hurricane-proof building in Mobile, AL, designed to withstand wind speeds of up to 250 MPH. We have designed and constructed buildings on Guam for diverse clients like Mobil Oil and Navy. We have been designing and building metal buildings in the states for over 30 years and have won numerous industry awards for technical merit, artistry and volume. We offer structural primary framing in factory standard prime coated steel, in field painted epoxy, tenemic marine grade coatings or factory galvanized to G90 designation. Our secondary structural system can be similarly treated. Panel systems can be exposed fastener, concealed fastener, field insulated, factory insulated panel systems, or SIP hybrid panel system designs. Our panel systems can be steel, aluminum or copper and we can provide custom and exotic paint systems in addition to economical standard paint systems in a variety of profiles. For government work we proudly offer American Made products and services but can provide alternate nation products for less specification intensive work not covered under the Buy America Act. We have a unique history of designing and building metal structures in diverse regions from New York to California, Latin America, Africa, Haiti and the Pacific Rim. Insulated metal panel systems combine the efficiencies and strengths of metal panel systems and high density urethane foam liquid injected between the inside and outside faces of metal panels. Thicknesses range from 2 inch to 6 inch, (r=14 to r=42) and are used for roof and wall coverings. Offering superior insulation values these systems are engineered for durability and long life. 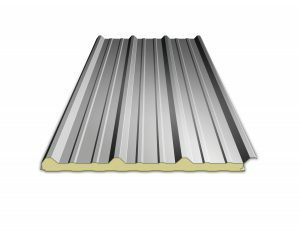 Like our metal panel roof and wall systems, these products come in through fastened and concealed fastened systems and are also available in standing seam roof profiles. Insulated Panel Systems are ideal for cold storage and controlled atmosphere facilities and can be used as retrofit and replacement panels or designed as part of a new building system. 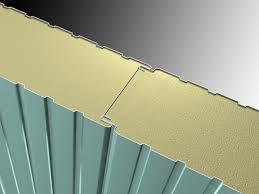 Insulated metal panels are also ideal for modern, sleek commercial looking building applications, They are the panel system for choice for airport and high tech facilities, as then can be made either fluted or flat, mounted vertically or horizontally and with wet or dry joints as esthetic features.